One thing all hospitals have in common, no matter where they are located or how large a budget they receive, is their requirement for hospital beds. Even the most basic level of healthcare produces a large demand for beds in order to provide relative comfort for patients and a good standard of hygiene. However, whether these beds are bought outright or rented depends on a number of variables which must be examined by the individual hospital. Both buying and renting hospital beds produce their own set of advantages and disadvantages which should be considered prior to making a final decision as to which avenue to choose. Renting hospital beds can provide a viable and attractive opportunity for hospitals that are experiencing financial pressures. This may be due to the current economic climate or a resulting reduction in budget, simply a small overall healthcare budget or even an urgent requirement toward the end of the budget period. In any of these situations the rental of hospital beds eliminates the need for a large outlay in acquiring hospital beds and means that the beds can be paid for on a periodic basis rather than in a single large payment. Making such a decision can greatly reduce the financial burden upon the hospital until such a time when the hospital can afford to acquire its own beds. Renting hospital beds can likewise provide a viable and attractive opportunity for hospitals when a temporary requirement for additional beds arises. Such a temporary requirement may come about during a period when a particular disease is epidemic or even pandemic. Purchasing new beds may simply not be an option in such an instance due to budget constraints, bed availability or simply due to the temporary nature of the requirement. In such a situation renting hospital beds presents the ideal solution to rapidly increase patient capacity within a hospital for a small cost relative to procuring new beds for such a short period. When the disease is contained and the number of patients is reduced, the surplus hospital beds can be simply returned to the rental company. Similarly, hospital bed rental can be an attractive option if a hospital is undergoing rapid expansion. In such a scenario, a large proportion of the hospital’s budget may be used in the new construction work and the fitting of essential equipment. Little or no funds may be available for the purchase of new hospital beds and so in the short term rental may provide the ideal solution to relieve the shortfall. By taking such action financial pressures upon the hospital may be relieved, allowing for the provision of lifesaving apparatus. 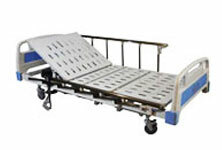 Renting hospital beds can provide an option to hospitals which is both viable and attractive in a number of instances. These situations are both numerous and diverse but include financial constraints due to limited budgets and temporary requirements due to disease epidemics, rapid hospital expansion or even response to national emergencies or natural disasters.